All tunes are written as single-line melodies for flat-picked guitar chords over the staff. Additional notes and references, plus a discography are included at the end. 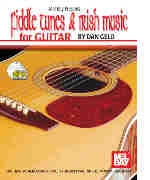 Tunes from the book are derived from different cultures, there is little or no overlap of titles regarding the book and "Complete Fiddle Tunes for Acoustic Guitar" (95471). In notation and tablature. The split-track recording includes Dan Gelo's teaching on the various techniques.